A representative from Audible.com gave me a free copy of this audio book in exchange for my review. I grew up in the Apostolic Pentecostal religion. For people that don’t know the religion, they live by a “holiness standard.” Women must wear skirts below the knee and sleeves below the elbow. We may not cut our hair or wear makeup and we are discouraged from aspiring to higher education unless it is a Bible College due to the damaging influence of the “world.” Before reading [easyazon_link identifier=”1909269034″ locale=”US” tag=”rabidreaders-20″]“Church of Fear”[/easyazon_link] I thought that I had experience in a restrictive religion, but never did I imagine such a cult as Scientology existed. The author, former BBC Investigative Reporter, John Sweeney, is well known for his research of this religion. A clip from his interview with Scientology leader, Tommy Davis, went viral. Sweeney, in the clip, explodes at the religious leader and in the aftermath of the clip, Sweeney said that he’d had enough of the bullying, constant scrutiny and harassment to which Davis subjected him. The clip itself it a good preview to the feel of [easyazon_link identifier=”1909269034″ locale=”US” tag=”rabidreaders-20″]“Church of Fear”[/easyazon_link]. The audio book, narrated by Sweeney, shows the author in a frequently frustrated and confrontational light while investigating his topic and meeting with road blocks and evasive characters. John Sweeney’s thick English accent was certainly an adjustment for this reviewer from the Midwest United States requiring some extra focus at the start of the book. By the time the book got going, Sweeney’s rapid fire and, at times, indignant delivery, helps move the narrative along. In the course of his interviews, Sweeney speaks with high-level member Leah Remini. She confirms that Scientologists don’t use the Internet and does not claim any knowledge of confessions being taped and used against members at a later time (and sometimes in casual conversation). In the first episode of the second season of the actresses TLC show “Leah Remini: Its all Relative,” Remini discusses her reasons for leaving Scientology. She says that she had questions to which she was not getting answers while in a group therapy session with relatives, who were excommunicated for Scientology for staying in contact with her when she left. One has to wonder if perhaps the light of doubt wasn’t lit in that first interview with Sweeney. In the episode, Remini’s brother-in-law (also a member of Scientology from childhood) tells of seeing a woman manhandled down a hallway as a seven-year-old and it being so routine that he didn’t think anything of the incident. Sweeney is able to, and in fact does, exhibit the displeasure and harassment from the cult members. At one point in the book, he lists text messages received from Scientologists; and those messages are illustrative of people with a lot to hide. For all of the ire he expresses, Sweeney does seemingly have a great empathy for those members that remain opposed by expectation and live in fear of leaving the religion. He acknowledges that most of the reaction is due to the price his subject will pay by exposure. In one memorable interview, Sweeney speaks with a woman who is placed in a position where she must listen to the confession of a man from whom she feels weird vibes. His confessions are rife with detailed sexual fantasies about the listener. At one point the woman us brought into a room and kept there until she gave detailed sexual fantasies made up simply to leave the room and give church leaders what they wanted. There fictionalized fantasies were later used as leverage to keep the church member in line. Sweeney knew the cost this woman would (and did) pay escaping a life of always living in someone else’s pocket. I cannot speak of the technical style of [easyazon_link identifier=”1909269034″ locale=”US” tag=”rabidreaders-20″]“Church of Fear”[/easyazon_link] as I listened to it in audio book form. The construction is rapid style, moving from one scene to the next, which may be distracting for some readers, but made for a fairly perfect audio book. After adjusting to the author’s dialect, I upped the speed of the reader to 1.25 and let the engrossing narrative fly. The dialogue, originally spoken by Sweeney, is not stilted or awkward but flows as words would in authentic conversation or confrontation. I knew nothing of Scientology before reading [easyazon_link identifier=”1909269034″ locale=”US” tag=”rabidreaders-20″]“Church of Fear”[/easyazon_link] beyond its celebrity members. Certainly, how separated the isolationist cult is was from traditional religion (Christian, Muslim, Buddism, etc. ). Scientologists believe that we are immortal beings that have lost our way. With each page read, I was more and more entranced with the subject and the concentrated effort using influence, media and police to try to suppress John Sweeney. [easyazon_link identifier=”1909269034″ locale=”US” tag=”rabidreaders-20″]“Church of Fear”[/easyazon_link] was an amazingly intimate look at a world to which readers may never otherwise have been exposed. 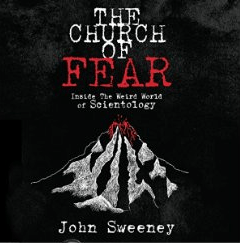 [easyazon_link identifier=”1909269034″ locale=”US” tag=”rabidreaders-20″]“Church of Fear”[/easyazon_link] by John Sweeney is a wonderfully interesting and informative read. If you’re interested in cults, human nature and organizational control pick the book up today and if you’re in the mood for a special treat, be sure the version you buy is the audio book. Listen to the first minutes and buy The Church of Fear by John Sweeney on Audible. John Sweeney is an award-winning journalist and author. He investigated the Scientologist Church for more than half a decade. For more information about him and his work, visit his website. You can connect with him on Goodreads and Twitter @johnsweeneyroar.